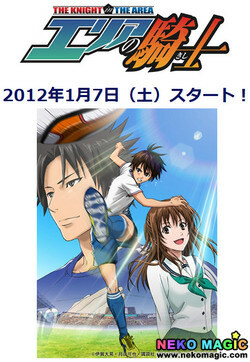 December 13th, 2011 By: GGT Category: 2012 winter release, Anime News. Humans have been menaced by mysterious monsters called “Designated Aberrant Disaster: Noise”. Tsubasa and Kanade are a popular vocal unit “Twei Wing”. 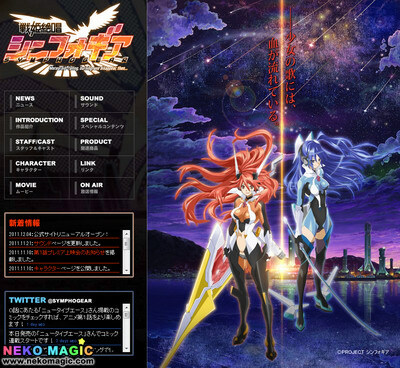 They wear the new weapon “Symphogear” and fight against Noise to save the earth. Believing himself to be useless at soccer, Aizawa Kakeru opts to become the manager of his schooll’s soccer team, while his brother Suguru is its ace, and is even good enough to represent Japan. However, Kakeru may be harbouring a strong talent within himself that only Suguru can see, and the two often get into arguments over Kakeru’s denial of his skills. Things are made more complicated with the return of Nana, an old playmate of them that Kakeru has a crush on. 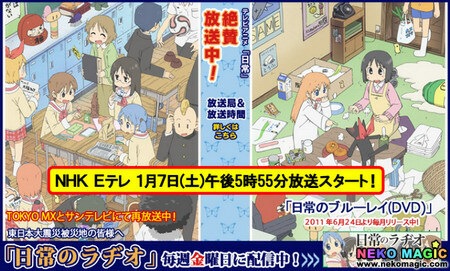 A re-run of the Nichijou TV series, re-edited into a 12-episode version for NHK’s ETV channel. The ordinary life of the peculiar students from class 1-Q and their odd acquaintances. The TV anime series Zero no Tsukaima F is created by studio J.C. Staff as the fourth and final season of the Zero no Tsukaima anime series, featuring the pink-haired tsundere loli Louise. 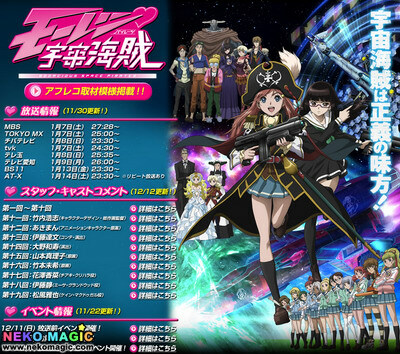 The TV anime series Mouretsu Pirates (Violent Pirates) is adapted by studio Satelight (Macross Frontier), based on the space-opera adventure novels Mini-Skirt Uchuu Pirates originally authored by Yuichi Sasamoto and illustrated by Noriyuki Matsumoto. The story centers around a spirited high school girl named Marika. She keeps herself busy with the space yacht club and her part-time job at a high-class retro cafe. One day, two men suddenly appear and claim to be subordinates of her dead father. They demand that she assume command of the space pirate ship Benten Maru. A privateer ship’s compact was made during a war of independence a century ago, and according to that compact, the ship must be inherited by the captain’s next direct descendant. Marika finds herself embarking on a new life as a space pirate. 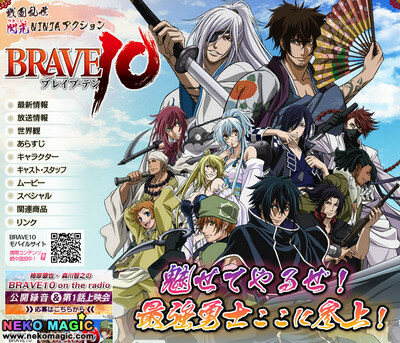 The TV anime series Brave10 is based on Kairi Shimotsuki’s manga sequel Brave10 S (Spiral). The story reimagines the legendary adventures of the 10 brave warriors assembled by the warlord Sanada Yukimura in the year 1600, in the middle of Japan’s tumultuous Sengoku (Warring States) era. 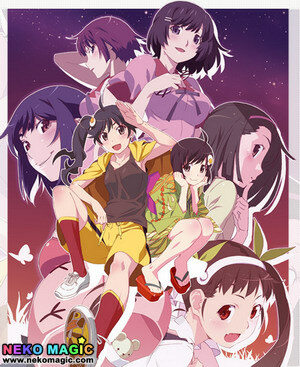 The TV anime series Nisemonogatari is created by studio Shaft, based on NisiOisin’s light novels with a story set in the early 21st century, as a sequel to Bakemonogatari (likewise adapted into anime, in 2009), and centering around the “Fire Sisters” Tsukihi and Karen Araragi. 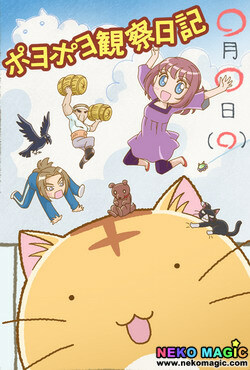 The TV anime series Poyopoyo Kansatsu Nikki is based on a Ruu Tatuki’s 4-koma slice-of-life manga about a mysterious “spherical cat” named Poyo, its family, and the people in Poyo’s everyday life. Aquarion Evol is the second TV anime series in the Aquarion franchise, which also spawned an OVA and anime film in 2007, after the first TV series’ debut in 2005. Studio Satelight is once again returning to animate the new anime, whose original story takes place in a distant future, when humanity is once again facing the threat of the “Shadow Angels” – mystical creatures who returned after 12.000 years of absence. The story is set in a city modeled after Hong Kong, with a new cast of characters, piloting a new Aquarion robot, fighting enemies from another dimension. 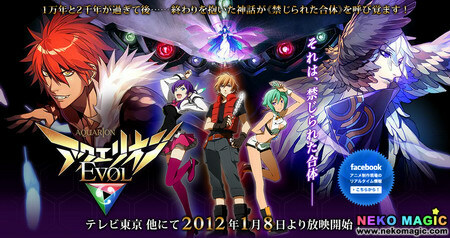 It has been hinted that the characters might be reincarnations of Apollo, Silvia and the others from the first series.